Anyway, I snapped a few pictures this year for those of you who couldn't make it this year. Batgirl posted a few snapshots of her own, so hopefully between the two of us you'll see enough to help get you in a baseball frame of mind, even though it's just January. Tomorrow I'll be back with some thoughts and reactions from my Twins-centric weekend. In the meantime, enjoy the show! The crowds were huge this year, especially on Saturday when over 12,000 people were in attendance. Johan Santana was truly the star of the show this year. 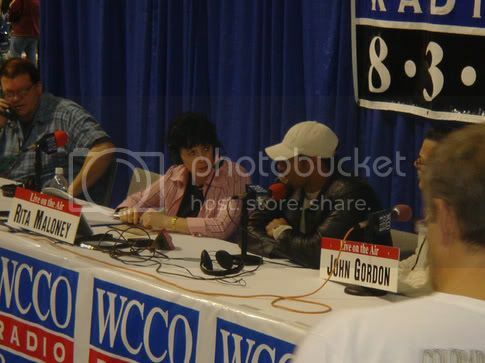 Here you see him signing some 'graphs and talking on WCCO radio with Rita Maloney and John Gordon (right). 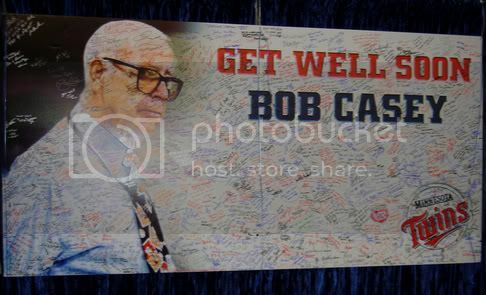 It was great to see this get-well card for Bob Casey. I don't know if Twins baseball would ever be the same without him. 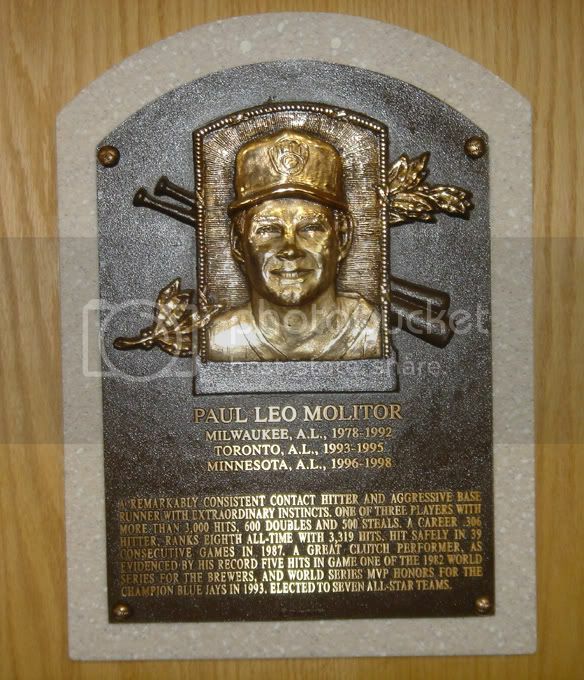 I definitely got a thrill out of seeing Paul Molitor's HOF plaque. 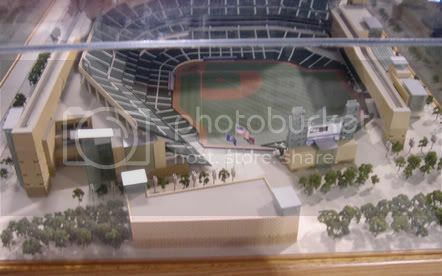 What are the odds we ever see this model (which has been around for a long time) ever come to fruition? Twins beat writer LaVelle E. Neal III interviews Twins president Dave St. Peter about this story for the Star Tribune, while right, Lew Ford signs some autographs. 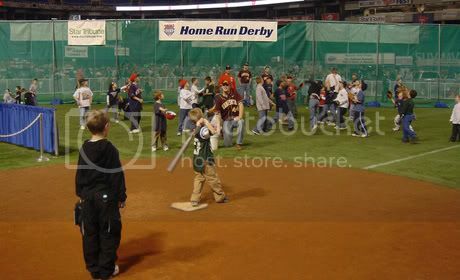 A young fan takes his hacks and an up close view of the now not-so-new FieldTurf (right). Unfortunately I don't have enough time to compile a full post tonight (I thought I had a good idea, but it sort of fizzled out on me) although I still do have something that I wish to call to your attention. Because my family shares a couple of season tickets with a few other people, we recieve four complimentary Twins Fest tickets every year. Since I am by far the biggest Twins fan of the group (in fact, notoriously so) everyone always gives the tickets to me. John or another friend of mine usually comes with me, and I just sell the other two tickets at the gate. This year, not only do I have my two extra tickets but another acquaintance (and fellow season ticket holder) has given me four more tickets because he's not going. Rather than just make a few extra bucks at the gate, I decided I would offer them to our Twins Chatter readers first. 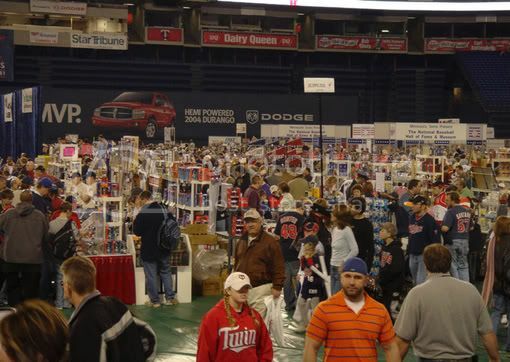 So, if you are planning on going to Twins Fest at the Metrodome this Saturday or Sunday and you don't yet have tickets, drop me an e-mail at twinsfan21@msn.com and perhaps we can work out some sort of pick-up situation. I'm willing to give them out for free (they'll cost you $10 each at the gate) to Twins Chatter readers only! Otherwise I'll probably just sell them for half price at the Dome on Saturday. Also, be sure and check back in at Twins Chatter Monday morning as I'll have pictures and perhaps a reaction or two from my annual trek to Twins Fest, as well as some other material from another Twins-related event this weekend. Until then, take care! -I always think it's great that the Twins do this Caravan every year. Sure, some of the stops are a bigger hit than others (our mid-sized auditorium was only about half-full this afternoon) but how many other teams care enough about non-Metropolitan areas as much as the Twins? Are there any? Like many other people, I really like this year's "Twins Territory" slogan. It fits perfectly. -Tony Oliva is a funny guy! Even though he is notoriously difficult to understand sometimes (anyone who's ever met him knows exactly what I'm talking about) he's still a great guy and I always get a kick out of it when I see him at events such as this. -Joe Mauer is a very low key and down to earth person. I sort of knew this before, but I'd never really had the opportunity to meet Joe before yesterday. 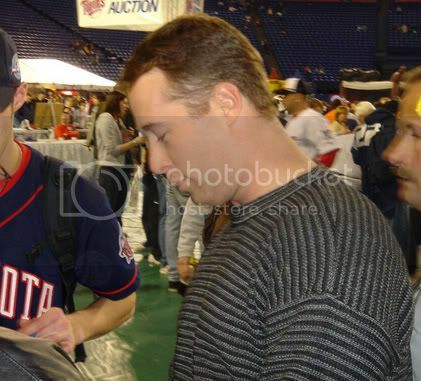 He was nice enough to sign a couple of things for my brother (and me too, I'll admit it). I'm not even a year younger than Joe and he seems like a pretty neat guy, someone who would be a lot of fun to hang out with. Seems strange to think of one of the Twins' stars in theat way, but it's the truth. Well, that's about all I have time for tonight. If you haven't read John's more extensive post from yesterday, be sure and do so sometime. Also, if you care to read my somewhat rambling manifesto from the other you can find it right here. Until next time, take care everyone. Hello again. Today we've finally delivered on that long-awaited Part Two of the post Ryan began two weeks ago. Also, if you care to read it, Ryan posted a little manifesto of sorts yesterday. 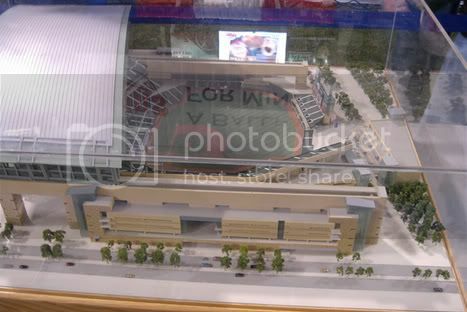 Changes will be coming to Twins Chatter over the next few weeks, so be prepared. A couple of weeks ago we took a look at the Twins position players for next year. The Twins have their entire pitching staff coming back for another run at the AL Central title. With the addition of some major league ready prospects like JD Durbin and Jesse Crain for a full season, the Twins can expect to have a strong staff. We said it repeatedly last year that anytime a team boasts a frontline starter like Johan Santana, a horse like Brad Radke and someone to shut the door ala' Joe Nathan, they have a pretty good chance to win playoff games. That formula came just short against the Yankees. This year could see the emergence of an even better staff creating possibilities come October. Today we will take a brief look at what we believe will be the team's opening day pitching staff including some possible dark horses going to spring training. It all starts with Johan Santana. The Twins need him to continue to be the most dominant pitcher in baseball. The last three years Santana has improved while throwing more innings in each. It would have been nice for him to have received a long-term deal this winter and there is still time for it to happen. Santana lost his arbitration case last year and is in danger of going back again. Based on some quiet comments he has made, there could be some bad blood between him and the organization and something like arbitration, where a player hears what his weaknesses are, doesn't help. There is also the concern of his workload eventually catching up with him. He has been a relatively healthy pitcher but he threw more innings last year then ever before and that can often be a concern. Anytime a team can throw someone like Johan Santana every 5th day it takes a lot of pressure off the other 4 guys in the rotation. Brad Radke signed for a discounted rate this past winter. He has been the stalwart of the rotation for the last decade. He remains the perfect compliment to Santana. He is calm, effective and throws a lot of innings giving the team a chance to win every time he starts. Carlos Silva emerged last year after coming over from Philadelphia. His production exceeded almost everyone's expectations. It remains a question of whether he can do it again. He struggled during the middle of last season and had some problems giving up too many hits. He was then ineffective during his start in the playoffs. More then any other pitcher on the staff he may suffer the most from the drop-off in fielding behind him. He is probably better suited as a 4th or 5th starter. Kyle Lohse had a rough season last year to say the least. He has struggled to be consistent and at times appeared to be pitching without a plan. The direction he takes this year will be a big factor in how well the Twins do. He is capable of being a good major league pitcher but if he continues to struggle it may be time for the Twins to look elsewhere. Last season, Terry Mulholland fell into this spot. He did remarkably well considering he is very old and it had been several years since he had started regularly let alone pitched well. Mulholland will have a chance to make this team again but ideally it would be as a rubber armed long man out of the bullpen. That leaves this spot for JD Durbin or Joe Mays to win. Durbin had the year of seasoning he needed in the minors and should be ready to make the adjustment this year. He looked overly excited in his brief appearances last season but has had an entire winter to get the butterflies out of his system. Mays remains the forgotten man. He did not pitch last year while costing the Twins millions of dollars in what is the worst Twin's contract in recent memory. Before he began experiencing arm troubles Mays had a pretty good year in 2001 and if he can come close to approaching those numbers it would go a long way towards solidifying the rotation. After all the Twins are paying him the big bucks they might as well get some production out of him. Joe Nathan is the Twins All-Star closer and with his nasty slider and 95 mph plus fastball he will continue to dominant this season. Juan Rincon had a great year last year as part of the Twins 1-2 bullpen punch. The hope here is that there are no lingering ill effects from how he ended the year against the Yankees. The best bet is Rincon will put it behind him and be as strong as ever. It is time for Jesse Crain to emerge into this role. He pitched very effectively after his call-up last year but remained in the bullpen as the Twins lost the second game to the Yankees in extra innings. This year, it should be expected that Crain can handle those pressure situations and take some of the workload away from Nathan and Rincon. It is a great luxury to have 3 great relievers and especially important for a team that lacks a reliable lefthander. It remains to be seen just how much the Twins will trust JC Romero in the late innings. He had yet another inconsistent year. He remains an enigma that the Twins have now invested another 2 years in. In the meantime we are all left wondering what it would be like if he was ever able to put it all together. The key for Grant Balfour is staying healthy. It took half the season for Balfour to show what he can do. He was still too inconsistent but his arm is lightning in a bottle as he demonstrated in game four of the ALDS. There is a slim chance he could start but because of his history of arm troubles the Twins seem more likely to keep him in the bullpen. See Durbin, Mays or Mulholland. The other possible candidates include Boof Bonser, Matt Guerrier, Rule 5 pick Ryan Rowland-Smith and Pat Strange. Okay. I'm not going to lie to you all. First off, John and I are flattered that people have been still check the site occasionally to see if anything new has been written in the past two weeks, despite the fact that you have been disappointed each and every day. I know I said I was "back" that fateful day, but truth be told, I wasn't ready yet. Writing, just like anything else, takes time. When John and I first started Twins Chatter early last year, we had lofty ambitions. We thought that we could create something that would bring us notoriety within the online Twins community and, potentially, even beyond that. We thought that we could bring all the best aspects of Aaron Gleeman, Twins Geek, Seth Speaks, and all the other Twins blogs together to create something special. Well, we were successful in some ways and unsuccessful in other ways. We did succeed in getting the name "Twins Chatter" out into the online Twins community. We averaged a fair number of visitors per day during the season, and we were often linked by other blogs and websites (which was nice). The peak obviously came when John and I were pictured on the front cover of the Star Tribune's Variety section on October 5. It was incredible to pick up a copy of the most widely-read newspaper in the Upper Midwest and to see my smiling mug featured in all its colorful glory. Friends, relatives, even acquaintances all walked up to me and congratulated me for months afterwards, saying they had seen the picture (even if they had not read the actual article). I thought, "Man, it can only get better from here!" Even though our readership tripled during the playoffs, the motivation just wasn't there. John and I both struggled for topics as the off-season wore on, despite our promise to continue writing throughout the winter. Other things began to take priority over sitting down for two hours and typing something for "that silly website", as my parents once referred to it as. This January, it began to dawn on me: What if they're right? What is a blog, exactly? Many articles have been written in the mainstream media lately examining this rather recent phenomenon. Why to people continue to participate in this activity? What do they hope to achieve? Most importantly, why do so many Internet users continue to visit them? Over the past two weeks, I've done a lot of thinking on this subject. I came to this realization: I am not a true blogger, and neither is John. We're not like Aaron Gleeman, who somehow manages to write long, detailed, and (usually) interesting entries every day without fail, while still managing to write for a completely different baseball website at the same time. 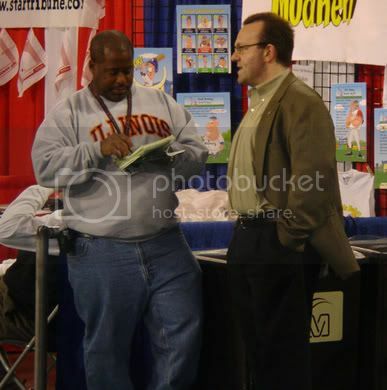 We're not like Seth Stohs, who manages to touch upon nearly every relevant topic in the sports world (and beyond) each and every day, spending hours of his free time in this pursuit because he finds it rewarding and enjoys the feedback from his readers. We're not like John Bonnes, who can take any little Twins tidbit (no matter how insignificant) and turn it into an insightful and interesting article that thousands of Twins fans will read every day. John and I simply do not fall into any of those categories. We're simply college students who enjoy the Twins and the game of baseball and thought it might be fun to start a website. We hoped it would catch on (perhaps more than it has), but we never realized the amount of work it would take to maintain in the long run. School isn't easy: there are classes, gobs of homework, side jobs, and social pursuits. After all that is done, it can be difficult to make time for something that, while occasionally rewarding, will never actually produce any tangible benefits. We very much appreciate the fact that you all enjoy reading what we write about the Twins; it's very flattering to know that we were actually missed during this hiatus. But the fact remains that I have never seen any of you and probably never will. You're not going to help me pay for our tuitions and you're not going to help us get a job after college. This brings me, finally, to the point of this entire rambling dissertation. After weeks of no communication, John and I had a little chat the other day. We had both been scared to check the site, for fear that it would have been left utterly deserted and confirming our worst fears that no one actually read it in the first place. But such was not the case, as you can see from the nine comments below. We decided, after all that had happened, that Twins Chatter was worth saving. We decided it would be saved, mind you, but not in its current format. I recently was able to procure copies of some very expensive software at a low, low price (i.e. free) with the intention of designing a new look for the site. I've put if off for a while, but I've decided once again to go forward with my original plan. A couple months back I bought the domain name "www.twinschatter.com" and I've decided to use it that name to its fullest potential. You may remember seeing a preview of our new logo a few months back, and that logo will be featured prominently within our new look. Expect the new site to debut sometime in early February. Also, with the new look we will be changing a few other things. No longer will Twins Chatter be merely a daily blog. I hope to transform it into a Twins-centric website instead. That means we probably won't be posting new material every day: we might have something new up twice a week, three times a week, or six times a week--it all depends on what's happening. It also means that we won't exclusively be writing Twins Geek-style reflective posts all the time. Some days there might just be a couple of thoughts about the previous day's game, sometimes there might be some links to other web material, sometimes there might be a post about not even related to the Twins (although it will probably almost always pertain to baseball in some shape or form). We've decided to branch out a bit more instead of limiting ourselves to the constraining mold of "Twins blog", which can be stifling at times (or so I've found). Whew! I think I've said quite enough for one day. I don't know how much we'll be updating this site while the new one is under construction, but I can give you specific timeframes for a few upcoming Twins events. Monday afternoon Joe Mauer and the Twins Caravan are coming to Northfield High School and I plan to go with my dad and brothers to meet Joe and perhaps get an autograph or two (my roommate, who's currently overseas, is a big Joe Mauer fan). Then on Saturday, Terry Ryan and an unannounced Twins player (who's identity I am privileged enough to know but unable to reveal) will be coming here to St. Olaf to speak at our baseball clinic. Coincidently, next weekend also happens to be Twins Fest, to which I get free tickets every year and always enjoy attending. So I will undoubtedly have updates from those events and probably snap a few pictures as well. If you're curious, feel free to stop check out the site next week. In the meantime, if you have any thoughts about my little (err, perhaps not-so-little) manifesto above, please leave us some feedback. If you don't have any opinions, then obviously you don't have to leave any feedback. 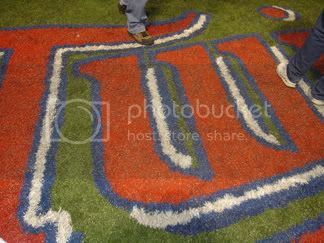 If you have any suggestions (or perhaps have experience in web design) feel free to e-mail me at twinsfan21@msn.com. The hiatus is over, but the changes have only just begun. By the time most people enter the hallowed halls of higher education, they have long since dismissed any dreams of playing professional sports. But have you ever entertained the possibility making a career with a professional sports team? Mike Herman ’98, former Ole baseball player and Messenger sports editor, is living out such a dream. He is currently holds the position of manager of media and player relations for the three-time American League Central Division Champion Minnesota Twins, dealing with players like Johan Santana, Torii Hunter, and Joe Mauer on an everyday basis. Mike recently took some time out from his busy schedule to chat with the Mess from the Twins’ spring training home in Fort Myers, Fla.
What were some of the reasons you chose St. Olaf in the first place? Well I actually started college at Iowa State for a semester, but then I realized I still wanted to play baseball in college. A good friend of mine told me to swing by St. Olaf on my way home from Iowa State, which I did. I talked to [head baseball coach] Matt McDonald, and we decided it would be a good fit for me to transfer. How did your St. Olaf education prepare you for your current career? What would you say are some of the advantages or disadvantages to attending a small, liberal arts college (at least in your line of work)? I think the biggest advantages of going to a school like St. Olaf is that communication in general is so important. Because it’s such a small school, you always have to work with different groups of people—whether it’s talking to all the coaches as the sports editor or being in class with people from all different walks of life. I had to understand and relate to everyone I came into contact with, and I think that helped me a lot in my current field. For instance, it’s easy for me to sit and talk with a Japanese reporter, and, despite the language barrier, I’m able to communicate with him and help him get whatever he needs. St. Olaf is a place that really promotes diversity, and I was able to meet a lot of people from a lot of different places while I was there. I would say a disadvantage is the fact that there was no specific major for what I wanted to do. That’s a problem for a lot of people when they want to get into this line of work. People ask us what sorts of things they need to do school-wise in order to get into this field, and our response is always it doesn’t matter where you go to school or what your major is, as long as you have the background through internships or independent studies—that’s the way to get a job. If I looked at every resume that came across my desk, they would all have the same types of school training. They would all be advertising, public relations, journalism, or communications majors. The classes themselves prepare you in some ways, but they don’t get you the job. The job comes from the work you do outside the classroom. How would you say your experience in collegiate athletics impacted your life? It was definitely a great opportunity for me to play [baseball] at St. Olaf. At a smaller school like St. Olaf, it’s kind of similar to high school in some ways. You have a group of friends that you hang out with most of the time, and when I got to St. Olaf I instantly had 35 guys that I knew, and they all had friends that I was now connected to. As a transfer student, this helped me become more comfortable in that new setting. That first semester [as a first-year] is when you make many of your friends, and sometimes there’s a sort of wall around that group that’s tough to break through. But I was lucky enough not to have to deal with that, because I had my friends on the team. Being on the team also allowed me to maintain that competitive drive I had in high school as an athlete. [Being competitive] has helped me here with the Twins because you can’t break into and succeed in this business if you are passive. Through my athletic involvement, I was able to learn that if I want something, I have to go after it. It’s also about proving to my employer that once I get in, I can still be successful at what I do. Just like Coach McDonald had enough confidence to send me out to the mound and hold a close lead, my bosses have to know that I’m going to go into that clubhouse and get all the interviews done that I need to get done, not just blow them off. How does your job differ during Spring Training? That also applies to the baseball side of things. We have so many homegrown players, especially compared to teams like the Yankees that barely even have a farm system [due to trades], and we always know there’s someone in the minor leagues that can come up and help us. There’s a “Twins way” of playing, and it’s taught in the minor league system. If we call a guy up, he knows what’s expected from him in order to get to the major leagues, because that’s all they’ve been pounding in his head for the last six years. That’s why this organization. Well it’s great to finally be back and talking about everybody’s favorite hometown nine, the Minnesota Twins. Since we last had a substantial post (which was right after the arbitration deadline), almost nothing has happened in the Twins world (okay, perhaps next to nothing). No more free agent signings, no more contract talk, no more trade rumors. For better or for worse, that’s the way it’s gonna be until spring training. The players currently on the Twins’ roster are the same players that will be taking the field on April 4 in Seattle. But just who are these guys? Are they similar to the team that should have beaten the Yankees last October? Do they resemble the group that took the league by storm in 2002? Are they the same ones that lead the Twins out of obscurity in 2001? The answers to those questions? Kinda, No, and Not Even Close. We’ve got a bunch of new names to learn this spring, and even more if you weren’t paying close attention late last year. Today I’ll take a quick look at the Twins’ potential position players and highlight the ones I think will most likely make the Opening Day 25-man roster. Tomorrow (or possibly Friday) it will be the pitchers’ turn, so be sure and stop by then. In the meantime feel free to agree/disagree with my thoughts in the comments section below. 1. Joe Mauer- This pick is obviously a no-brainer. Hopefully Joe will be at least moderately healthy this year, and if so, he will probably be one of the better all-around catchers in the league. An All-Star appearance is definitely not out of the question. 2. Mike Redmond- Many Twins fans questioned Terry Ryan’s judgment when he gave almost $2 million to a backup catcher for two years, but money aside for a moment, Redmond will be an excellent backup and an adequate fill-in should (knock on wood) Joe be injured. 3. Justin Morneau- I’m extremely excited to see what Morneau can do in a full season at the major league level. He’s going to have his ups and downs (although he’s starting to recognize and correct his weaknesses) but 2005 could be the start of a very special career for this young man. 4. Luis Rivas- It’s just eating me up inside that Luis Rivas will be starting at second base AGAIN this year. He’ll soon break the team record for most undeserved second chances given (a record currently held by LaTroy Hawkins). Rivas is terrible, and hopefully it won’t take Gardy and the Twins 500 at-bats to realize it this year. 5. Nick Punto- Barring some unforeseen injury/collapse, Little Nicky Punto will probably make the team again this year as a utility infielder (I’ve put him at second base because that’s where he’ll probably see the most action early on). Not a bad guy to have around, especially since he’s cheap and plays hard (sometimes even too hard). 6. Juan Castro- Entering Spring Training, Castro is the odds-on favorite to win the starting shortstop job. Not because he’s a superior player, not because he’s a veteran, and not because he’s making too much money (which he is), but simply because he’s the quintessential “Twins player”. Castro is a whiz with the leather and usually put the ball in play, which makes him a much safer pick than the next guy on this list. Even though the Twins don’t always follow the “safety first” rule, I believe they probably will in this instance. 7. Jason Bartlett- Yep, you heard it right here at Twins Chatter: Jason Bartlett will make the Opening Day roster, but not as the starting shortstop. I know I’m going out on a limb here, as this isn’t usually the path the Twins take with their prospects, but hear me out. My prediction is that Bartlett has a decent spring (especially with the bat) but not a good enough one for Gardy to give him a full vote of confidence. He’ll open the season as Castro’s platoon partner/pseudo backup, and if he plays well early on, he’ll be given the job while Castro moves into a utility role (spelling Rivas and Cuddyer). 8. Michael Cuddyer- I’ve often expressed doubt that Cuddyer can play third base defensively at the major league level, but it appears the Twins have enough faith in his abilities to pretty much hand him the job. Make no mistake: Cuddyer will hit if he’s given an everyday job. He might strike out 120 times in 500+ at-bats, but he’ll also hit 20-25 homers and drive in his fair share. But on defense? I’ll believe it when I see it. 9. Torii Hunter- Now we’re finally coming to the easy ones. Torii, whether he likes it or not, is stuck here for a few more years. In the meantime, how about developing a smidge better plate discipline? Just a thought. 10. Jacque Jones- The second half of the Twins’ dynamic duo will be sticking around for another year it seems (a trade is not going to happen). JJ will put up solid numbers and will man the baggie once again in ’05. 11. Shannon Stewart- A healthy Stewart in 2005 could go a long ways towards correcting the ills that face the Twins’ offense. This guy hasn’t stopped hitting ever since we stole him from the Jays that fateful day a year and a half ago. 12. Lew Ford- I keep hoping that Gardy will come to his senses and put Sweet Lew in left and just leave him there, but I’m afraid Lew and his superior defensive abilities will only see limited action in the field again this year. At least his bat will show up in the lineup every day. 13. Micheal Restovich- With Ford DHing most days, the Twins will need to carry at least 5 outfielders to deal with emergencies (especially considering that Cuddyer will be in the infield somewhere). Resto is out of options and unless he has an absolutely terrible spring, is likely to make the team. 14. Matt LeCroy- Here we are at last: the man without a position. LeCroy won’t see much action in the DH spot this year (most of that will go to Ford or Stewart) but he’s still going to make the team as a right-handed bat off the bench. He’ll also be Morneau’s backup at first base, which is startlingly un-reassuring. But even though he’s no longer seen as an everyday player, the big man can still swing the stick pretty well, which is good enough for me.